The first step in organizing your team effort is to determine the extent of the area susceptible to infestation. One way to do this is to obtain a depth map for your waterbody. 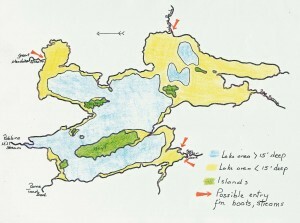 Depth maps are available on Lake Stewards of Maine (LSM) Lake Pages. Click here; enter the name of your lake; choose the correct lake from the list (if needed); scroll down your lake page to the depth map. 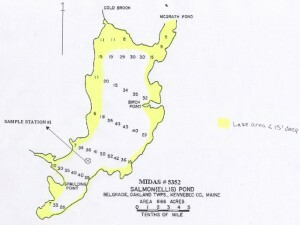 Maps may be downloaded and/or printed directly from the webpage. Study the map. Determine and mark (using highlighters, colored pencils, marking pens, etc.) the approximate extent of the littoral zone (areas with depths equal to or less than 15 feet). 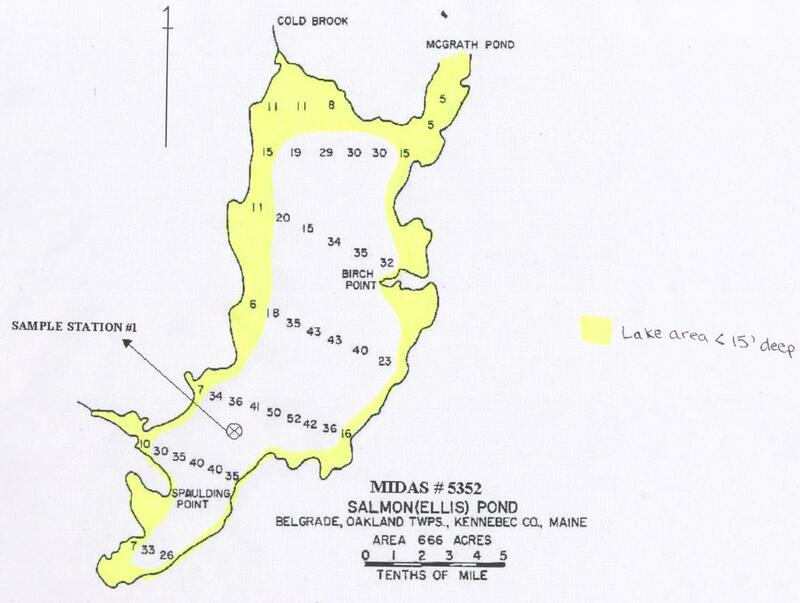 It is also helpful to mark protected areas that are likely to provide good plant habitat, inlets, outlets, and high-use areas (such as public and private boat launches, marinas, etc.). One of the greatest advantages of the IPP Team is the ability to break the large task of surveying the entire littoral zone of a waterbody into smaller chunks. Using a base map of the waterbody, divide the littoral zone into discrete sectors. Ideally each sector will be assigned to an individual surveyor or survey unit. Dividing the task up in this way allows each surveyor to focus more intently on a limited area, become intimately acquainted with the native plant communities in his or her assigned sector, and to complete the assigned task within a reasonable timeframe. The size of each sector will depend upon overall survey goals, the number of surveyors on your team, the size of the waterbody, the density of the native plant communities, etc. Sectors that fall along exposed, largely sterile sections of the shoreline may be larger in size; sectors that fall in dense, complex plant communities should generally be smaller. 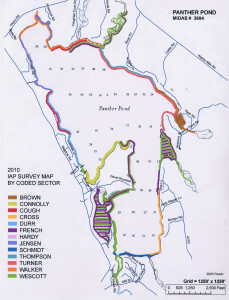 The Master Sector maps will show the boundaries of individual sectors, ideally coinciding with permanent landmarks on shore (the tip of Johnson’s point, the public boat landing, the large boulder at the southeast side of Turtle Cove, etc.). Sectors may be coded on the map (e.g. 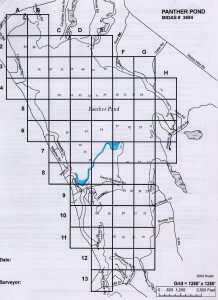 Sector A5) and these codes can be used to link records of individual survey activity to the map. Excellent base maps may be found online. Here are some links to free Google mapping tools to get you started. If you use these maps, you can highlight sectors using the paint tools that come with these mapping platforms. Click on “My Places”; choose “Create Your Own Maps” You will need a Google email account; if you do not have one you can set this up quickly from this page. Here is an example, created by LSM volunteer Keith Williams, showing possible ways in which Google Maps could be used to track and share IPP survey activity. 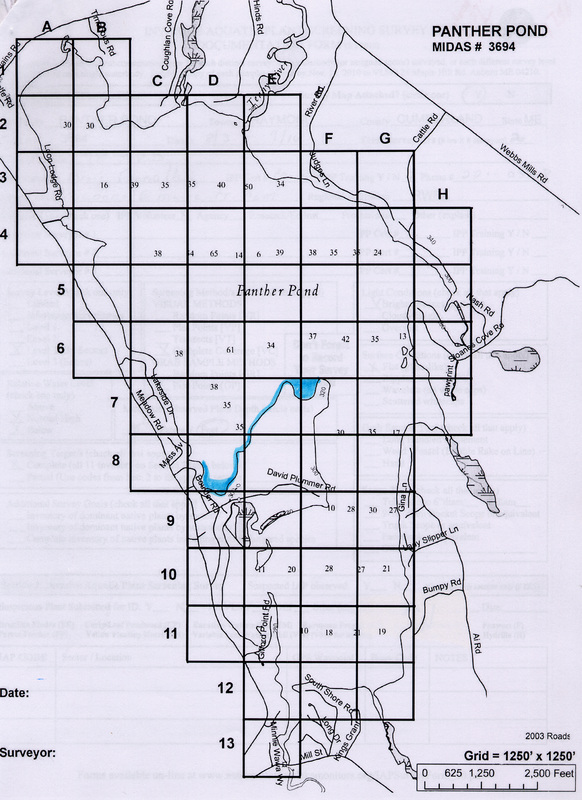 If you click on this link, it will take you to a map showing the sector that Keith and his partner Roger surveyed as part of the Tripp Lake IPP Rapid Response Team Survey, on June 27, 2011. For illustration purposes Keith further divided his and Roger’s assigned sector into four segments. 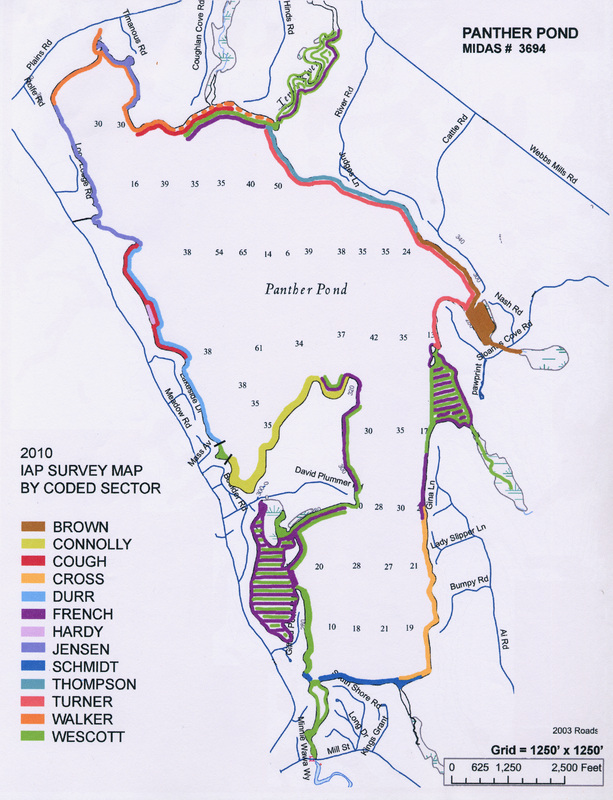 What you see is the northern part of Tripp Pond, with four lines of different colors. If you click on the dark blue line on the northwest shore, a box will pop up with a picture of a plant and a list of plant names. The picture is just a place-holder to show how you can embed links to pictures that reside somewhere on the internet, for example: on the LSM website, Google’ Picture Album, your Facebook page, Flickr, etc. You can even attach links to video clips! Click on the other colored lines and you see some more “fake stuff.” The lines show the sector Keith and Roger actually surveyed, but most of the text was fabricated for illustration purposes.